Our first day of environmental assessments went quite well. 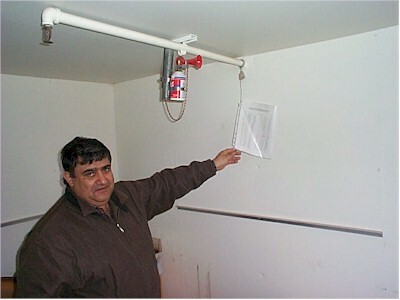 Here's my partner, Steve, pointing out an inspection log for the air horn in the hazardous waste shed. The regulations say that such a horn is required, but we rarely ever see a horn, never mind an inspection log saying that they've tested it every week. Turns out we found nearly every site that we visited in Iowa to be quite impressive, compared to past states. They make environmental compliance look easy.